Understanding how time travel works within string theory would require a complete understanding of how the fabric of space-time behaves within the theory. So far, string theory hasn’t exactly figured that out. In general relativity, the motion of objects through space-time is described by a worldline. In string theory, scientists talk about strings (and branes) creating entire worldsheets as they move through space-time. Worldlines were originally constructed by Hermann Minkowski when he created his Minkowski diagrams. 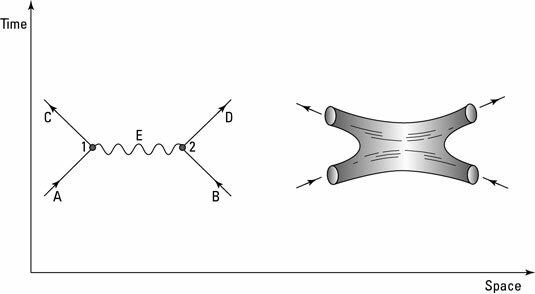 Similar diagrams return in the form of Feynman diagrams, which demonstrate the worldlines of particles as they interact with each other through the exchange of gauge bosons. In string theory, instead of the straight worldlines of point particles, it is the movement of strings through space-time that interests scientists, as shown in the right side of this figure. Notice that in the original Feynman diagram, shown on the left of this figure, there are sharp points where the worldlines intersect (representing the point where the particles interact). In the worldsheet, the virtual string exchanged between the two original strings creates a smooth curve that has no sharp points. One problem with both quantum field theory and string theory is that they are constructed in a way that gets placed inside the space-time coordinate system. General relativity, on the other hand, depicts a universe in which the space-time is dynamic. String theorists hope string theory will solve this conflict between the background-dependent quantum field theory and the background-independent general relativity so that eventually dynamic space-time will be derived out of string theory. One criticism is that string theory is, at present, still background-dependent. The competing theory, loop quantum gravity, incorporates space into the theory, but is still mounted on a background of time coordinates.